click here to go to the download section and check out the myriad of choices! And thanks again Chris, for the help! This set was a collaboration between myself and Chris Nickle (known as Cnickle on the forums) and they are based on my Superman Anthology set. 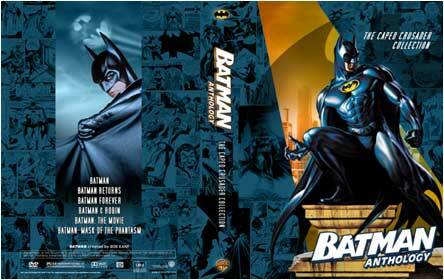 The examples below were made to house my complete collection of filmed Batman tales. 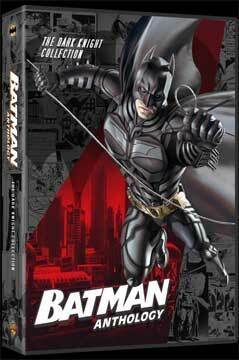 The first volume, The Caped Crusader Collection holds both of the Tim Burton directed Micheal Keaton films (Batman and Batman Returns) as well as the two sequels, Batman Forever and Batman & Robin. 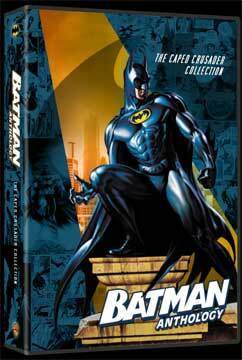 The set also includes Batman: The Movie, the 1966 feature based on the campy TV series and the animated feature, Batman: Mask of the Phantasm. The second set is called The Dark Knight Collection. 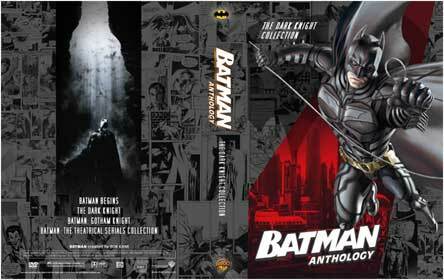 In addition to Batman Begins and The Dark Knight, my set also holds the animated Batman - Gotham Knight, and Batman - The Theatrical Serials Collection (Batman from 1943 and Batman and Robin from 1949). want different configurations, I have made multiple sets at different sizes and with different contents, but with the same artwork. For those that hate Batman Forever and Batman & Robin, there are are even versions that combine the Burton movies with the new ones. There are even choices where you can customize your own cover.